The Pro Angler 12 is the most versatile fishing boat we’ve ever designed. When the angling agenda calls for a stable, capable and budget-friendly kayak, the Hobie Mirage Pro Angler 12 stands ready. 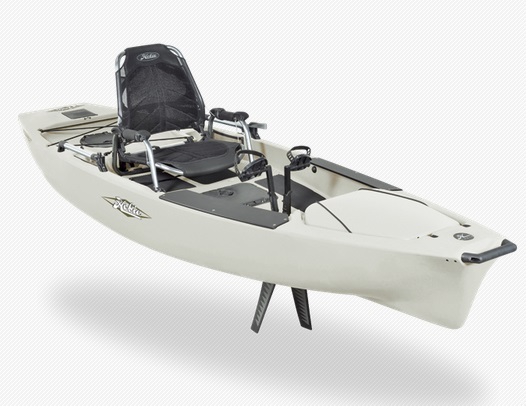 Its innovative rotomolded polyethylene hull form allows you to confidently stand and cast, and its fishing-specific deck configuration accommodates six rods (two vertically; four horizontally) while allowing immediate access to tackle. Generous bow stowage swallows gear, and the Livewell-ready, Bungee-secured stern cargo area increases versatility. A Turbo Fin-equipped MirageDrive enables efficient locomotion, and the adjustable Vantage Seat comfortably supports big adventures.